Heat oven to 375°F. In small bowl, combine cream cheese and pesto; blend well. Cut bread in half lengthwise. Spread bottom half of loaf with cream cheese mixture. Top with other half of loaf. Cut almost through loaf into 1 1/2-inch slices. Wrap securely in foil using double-fold seals. Bake at 375°F. for 8 to 12 minutes or until thoroughly heated. To reduce the fat in each serving of this bread by about 2 grams, use fat-free cream cheese in place of the regular cream cheese. 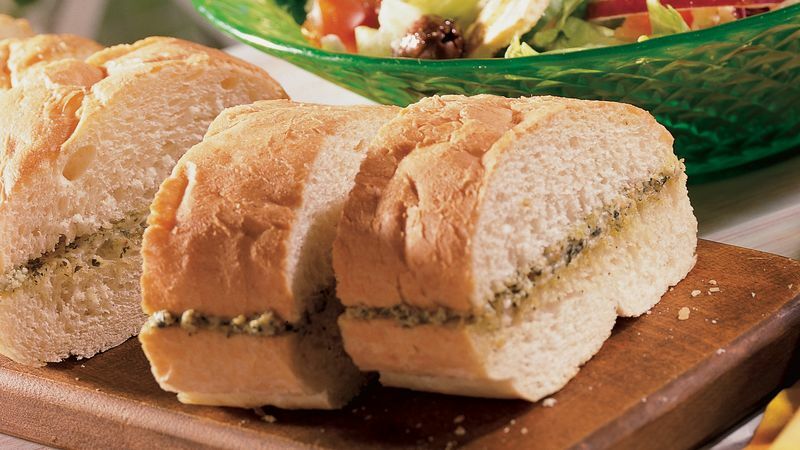 To prepare this recipe on the grill, wrap the bread in heavy-duty aluminum foil or a double-thickness of regular foil. Place the package on the grill over medium coals for 8 to 10 minutes, turning occasionally.